Considering a commercial cleaning service for your business? There are a number of cleaning companies that offer a variety of services leaving you wondering which to choose. MTO Janitorial offers these suggestions that you should consider when choosing a commercial cleaning service in Prescott. Does the company have a good reputation in the community? There are several websites that offer a platform for online reviews of service companies. By researching these websites, you can get a pretty good idea what companies are meeting or exceeding their customers’ expectations. How is their customer service? Again, social media platforms offer the ability to view complaints about businesses in your local area, giving you much needed information on whether or not you will want to do business with the company. In most cases, the reputation of a company and customer service will go hand in hand. Do they do quality work? Reviews and word of mouth referrals are some of the best ways to determine if the commercial cleaning service has a reputation of doing quality work. You want to hire a commercial cleaner that is consistently providing quality service, and understands what your cleaning needs are, whether industrial cleaning, medical offices, restaurants, and more. Is the service priced correctly? You obviously don’t want to overpay for the cleaning service, but the least expensive doesn’t always mean you’re getting the value for your money. We’ve heard that you get what you pay for, so when you compare prices, be sure to compare the services as well. Are the employees screened and properly trained? 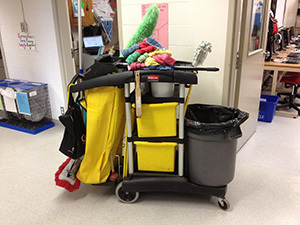 You want to be certain that the cleaners who enter your facility are not only trustworthy, but are trained in the best industry practices as well. As you consider hiring a commercial cleaning service, you’ll want to do your research to be sure that the company has a good reputation, does quality work and gives you great customer service at an affordable price. MTO Janitorial is focused on offering the quality standards you expect for your Prescott commercial facility. For a free estimate, call MTO Janitorial at 928-772-0004.